A late comeback from Bengaluru Bulls fell just short as Dabang Delhi K.C. 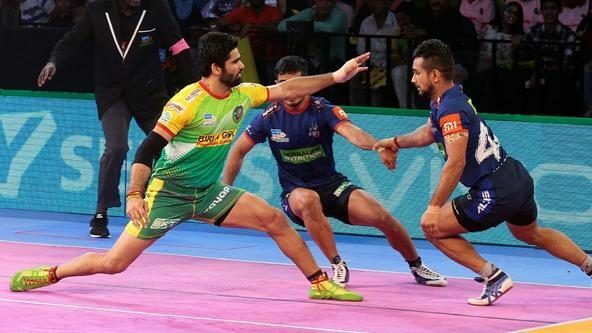 held on to win by a scoreline of 32-31 at the Thyagaraj Sports Complex in Delhi on Wednesday and tighten their grip over the third and final playoff spot in Zone A. Chandran Ranjit and Meraj Sheykh combined to score 14 raid points while allowing only two tackle points to Bengaluru Bulls’ defence in what was a solid outing for Dabang Delhi K.C.’s raiding department. Just like in their previous encounter, Dabang Delhi K.C. got in the groove right off the bat taking a four-point lead in just the fifth minute of the contest. Anand V managed to get his first point of the match via a bonus, but he was sent to the bench soon after by Naveen’s touch point. Ashish Sangwan, Bengaluru Bulls’ last man on the mat, also managed to pinch a bonus but was tackled by Ravinder Pahal, inflicting an All-Out on Bengaluru Bulls and giving the home side a 10-3 lead. With their back against the walls quite early in the contest, Bengaluru Bulls retaliated and scored three unanswered points to reduce the deficit down to just four. But two more raid points from Ranjit, split by substitute Anil Kumar’s tackle on Rohit Kumar snuffed out Bengaluru Bulls’ momentum temporarily. Pawan Kumar Sehrawat came alive in the contest with two quick raid points and the defence backed him with a tackle on Naveen Kumar as Bengaluru Bulls cut the deficit to just three points again. Ranjit, though, continued his solid night with a touch point on Sheoran just as the clock expired and the teams headed into the half-time break with Dabang Delhi K.C. leading 14-10. The second half commenced with Sehrawat’s touch point on Satpal reducing Dabang Delhi K.C. down to just three men as Bengaluru Bulls looked to even the scores. But with the Super Tackle on, Ranjit pounced on Sehrawat’s ankles and the defence backed Ranjit well, adding two crucial points to their score. Following Sheykh’s touch point on Ankit, Dabang Delhi K.C.’s defence stepped their game up and scored three tackle points - two from Ravinder Pahal and another from Satpal - to turn the tides and reduce Bengaluru Bulls down to just three men. 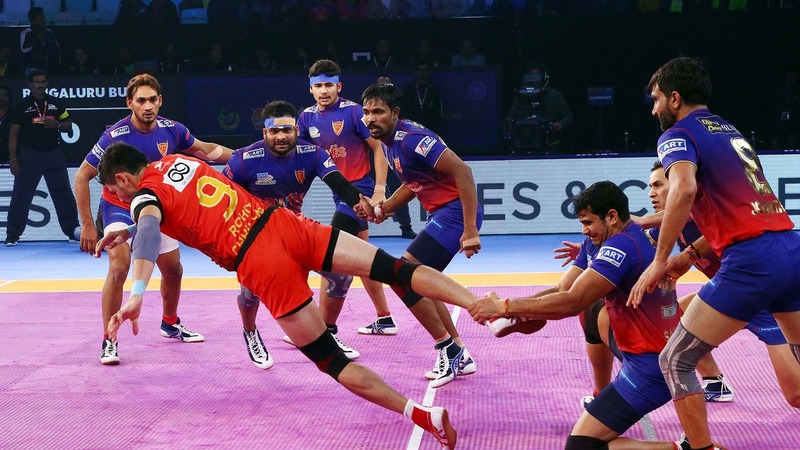 Sheykh, in a single raid, wiped out all three men on the mat to score the first Super Raid of the match and inflict an All-Out on Bengaluru Bulls to give his side a 26-14 lead. Rohit Kumar quickly responded with three points in two raids to reduce his team’s deficit and kickstart an unlikely comeback. 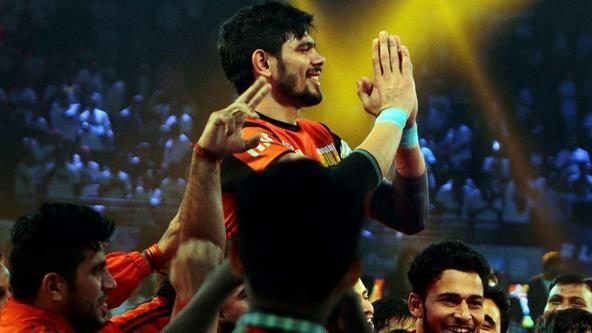 In a two-minute spell, Rohit Kumar pinched four bonus points and two touch points in just four raids to bring his side back into the contest. But Ranjit added two more raid points to his stellar night and Satpal finally managed to tackle Rohit Kumar to push the score back up to 32-25 in Dabang Delhi K.C.’s favour. 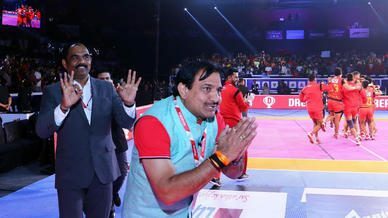 Raju Lal Choudhary’s tackle on Naveen Kumar followed by four quick raid points in three raids from Sehrawat reduced Bengaluru Bulls’ deficit down to just two with 27 seconds left. 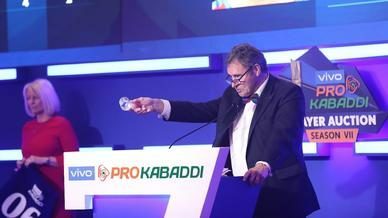 But Sheykh, after a dominating performance, showcased his understanding by using the entire duration of the clock to give up a point and ensure that Bengaluru Bulls did not get another chance to raid as Dabang Delhi K.C. held on to claim a win.